The campaign group Global Witness says it is leaving the Kimberley Process, an international scheme designed to stop the trade in so-called blood diamonds. The Process was established in 2003, amid concerns that diamond sales were funding conflicts in African countries such as Angola and Sierra Leone. It required all rough diamonds sold internationally to be certified. 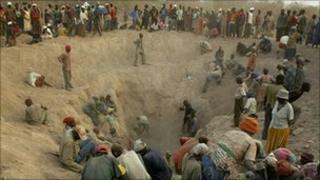 But Global Witness says the Kimberley Process has failed to break the link between diamond sales and violence. In the late 1990s, the organisation led a campaign to draw attention to the problem of conflict diamonds, and along with other NGOs was instrumental in setting up the Kimberley Process itself. Now, however, it has become disillusioned with the system. "Nearly nine years after the Kimberley Process was launched, the sad truth is that most consumers still cannot be sure where their diamonds come from", Global Witness founding director Charmian Gooch told BBC World Service's World Business Report. "The scheme has failed three tests," she says. "It failed to deal with the trade in conflict diamonds from Ivory Coast, was unwilling to take serious action in the face of blatant breaches of the rules over a number of years by Venezuela and has proved unwilling to stop diamonds fuelling corruption and violence in Zimbabwe." Human rights groups have been expressing concerns about the system for some time. But recent decisions regarding Zimbabwe appear to have brought them to a head. In November, the Kimberley Process formally agreed to allow two companies to export diamonds from Zimbabwe's Marange diamond field. That decision came despite claims from both Human Rights Watch and Global Witness that the Zimbabwean army has been involved in human rights abuses in the mining areas. It has also been suggested that funds from diamond sales might be used to fund orchestrated violence and intimidation of voters in the run-up to elections next year. "The Kimberley Process's refusal to confront this reality is an outrage," says Ms Gooch. "Consumers should not buy Marange diamonds, and industry should not supply them." The EU and US had blocked previous attempts to lift the ban. It was imposed in 2009 following allegations that Zimbabwean military officers had a stake in the industry. But last month, Europe's foreign policy chief Catherine Ashton said the EU supported the lifting of the ban because of "a renewed commitment by Zimbabwe to address outstanding areas of noncompliance". Human rights groups also claimed that people were forced to work on the mines and some of them were badly assaulted. The authorities in Zimbabwe have consistently denied the allegations.